All is fair in love and war - and in the Moscow mayoral race. As Navalny deals with accusations of receiving campaign funding from abroad, Sobyanin’s properties are the target of the opposition. 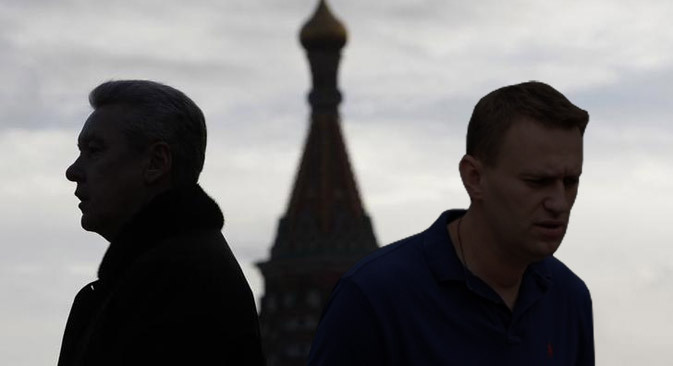 The first major scandals of the Moscow mayoral campaign have erupted. The Prosecutor General of Russia claimed to have found evidence that opposition candidate Alexei Navalny received funding for his campaign from overseas, while Navalny has released information about the misdealings of his main rival, current acting mayor of Moscow Sergey Sobyanin. Experts think the mudslinging is unlikely to swing voters one way or the other, although Navalny’s alleged transgressions may lead to his removal from the race. The Liberal Democratic Party of Russia (LDPR) was the first to drive attention towards the source of funding in Navalny’s election campaign. An investigation by the Prosecutor General’s office following a complaint filed by LDPR leader Vladimir Zhirinovsky has revealed that more than 300 foreign entities – businesses, private individuals and anonymous donors – from 46 countries and 347 addresses used the Yandex.Money electronic payment system to send money to the digital wallets of Navalny and other members of his campaign team. According to reports from Russian newswire Interfax, the evidence has been forwarded to the Investigation Committee so that a criminal proceeding can be initiated. According to Russian federal law it is illegal to receive funding for political campaigns from foreign governments, organisations, citizens and anonymous donors. Despite the prosecutor’s findings, however, the Moscow City Election Committee has stated that Navalny’s registration will not be revoked until a decision has been made by the courts. Vladimir Ashurkov, a representative for Navalny’s campaign team, said that he and his colleagues are closely monitoring all incoming donations to prevent violations. He added that questionable payments – those that are not accompanied by passport details or the full name of the donor – are forwarded to the federal budget, as the law requires. Mikhail Vinogradov, president of the St Petersburg Politics Foundation, believes that Navalny could be removed from the elections only if the “highest political powers” desire it. Apart from that, the financing scandal will not harm him. “Any kind of announcement about Navalny is going to be seen by his supporters as propaganda against him. It’s not in the authorities’ interests to remove him from the elections; it’s better to leave him alone and let him take part,” says Institute for Global Research and Social Movements director Boris Kagarlitsky. Stories have also been circulating about the properties owned by Sobyanin. Navalny posted on his website information regarding Sobyanin’s daughter and her apartment in the centre of Moscow. The property is 300 square metres (about 3200 square feet) in total area and has a value of around $5 million, more than the combined cumulative income of Sobyanin and his wife over the past five years. It is difficult to believe, therefore, that the apartment was bought at its market value. Sobyanin’s press office released a statement according to which the apartment was privatised in strict accordance with the law, and presidential administration spokesperson Viktor Khrekov has confirmed that Sobyanin was given the apartment when he was appointed head of the presidential administration - a position which he held before he became mayor of Moscow. Boris Kagarlitsky explained that Navalny is actually doing Sobyanin a favour, as he has drawn the public’s attention away from Sobyanin’s responsibilities as a mayor. Aleksei Makarin doesn’t think that the case will affect Sobyanin’s performance in the election, as people are not especially interested in which candidates own what property. It will only mean something for those who had no intention of voting for Sobyanin in the first place. “Nobody else is interested in all these revelations,” the political analyst said.